Her Majesty the Queen Mother, Sangay Choden Wangchuck graced the consecration of the 21 Taras or Drolma Nyishu Tsachi Thongdrel in Pangrizampa, today. 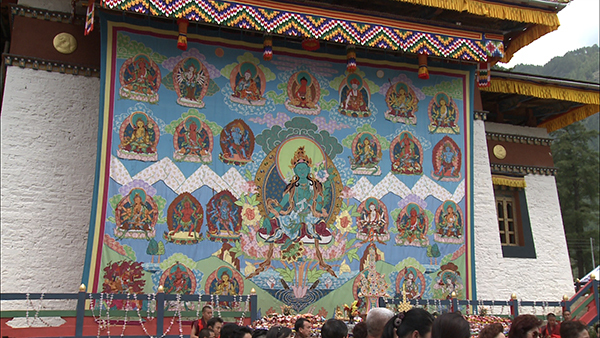 The Thondrel was unfurled at the Tara Lha-dhen Zhingkham Lhakhang and consecrated by venerable Dorji Lopen. The Thondrel, which took about a year to complete, is 36 feet wide and 26 feet tall. It is made of Thai silk. The consecration of the Thondrel is dedicated to the long life of His Majesty the fourth Druk Gyalpo. The Thondrel will be unfurled every year on the fifteenth day of the fourth Bhutanese month at the Lhakhang. I think that the name of anything that is related to dzongkha should be made in dzongkha and the alias or translation to be done in within brackets. e.g. Tara Lhadhen Zhingkham Lhakhang should have been printed or typed as Dema Lhadhen Zhingkham Lhakhang ((Tara Lhadhen Zhingkham Lhakhang..(translate in the required language)). That way for those who are knowledgeable in dzongkha and chhoeykey will be easier to understand and sound correct and don’t have to think or guess what tara is, for example.